Modern & easy to manage websites so you can focus on building your brand, working with dream clients & making that money honey! Isn't that what running a business is about? Otherwise, you just have a hobby. Websites & Digital Marketing - That you don't need an advanced degree, pocket protector or be a tech-nerd to understand. You're great at what YOU do (attorney, artist, acrobat?) but the "running a business" part feels like an entirely separate job! And, you can hardly keep up with the first one! You are frustrated with all things tech related. It seems there is something new to learn each week and you can't keep up! For the first time ever you can relate to your grandfather who was afraid of all things "new" He didn't trust ATM cards, cell phones or microwaves. 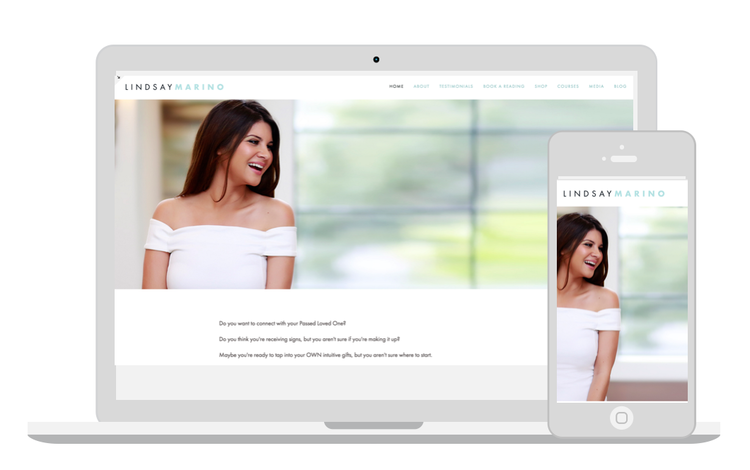 You want a beautiful website that you can feel proud to send clients to, but also something easy-to-update, post blogs or make simple changes without having to call in a professional every time. You've heard things like creating a brand, content marketing, newsletters, Facebook ads, blogging and SEO are all important but to be honest you don't know where to start or who to trust. You don't know your S-E-O or your C-S-S from your A-S-S and you want someone to interpret it for you. Preferably NOT your 11 year old nephew. But so far he's been your best option. I've worked with hundreds of entrepreneurs just like you creating beautiful images and brands for their business. I'd send them off with gorgeous high-end images and they'd come back with cringe worthy design jobs & botched websites more confused than ever. And many of these people were paying a LOT of money to these "experts" for things they really didn't need. Lesson #1: Unless you're Elon Musk. Or Amazon. You DO NOT need a $50,000 website. Especially if your business hasn't made that much money in a year. I've watched small business owners waste tens of thousands of dollars on things they didn't need, couldn't understand or were simply far too big for their (virtual) britches. Often they'd never even had a paying client and yet were told they needed to create a site intended for a multi-million dollar business. Or, and this one REALLY hits a nerve with me, they HAVE a website they just have no idea how to access it - even though they are pretty sure they've been paying for it for months b/c it's "being held hostage by their web designer" A particularly favorite expression of mine. Every small business owner deserves a gorgeous, well-designed site that doesn't require constant updates, plug-ins and a team of people to manage it for them. And guess what? You can have it! I've used an app on my phone to have everything delivered to my hotel from a Birkin bag to a blowdry service while flying 30,000 feet over the Atlantic Ocean sipping a glass of Prosecco. Elon is about to land on Mars. There is a pill that allows blind people to SEE. We HAVE the tools to get this stuff done. The problem? A lot of online "experts" are using 2008 solutions to solve 2018 problems. Lesson #2: You don't need a degree from MIT to update your blog. But, there are a lot of dodgy characters out there who will convince you that you do. Or, preferably, that you pay THEM monthly to do it for you. Whether you sell houses or design them, work as a fitness coach, a chef or a nurse. You don't have the time or desire to learn another skill. But you SHOULD understand how the very basics of your business work. New information moves SO fast it's hard for the average person to keep up. The good news? I GEEK OUT on this stuff. So you don't have to. I'm here to get you focused. Get your website launched. Your business running. And to give you ONLY what you need. Beautiful, clean modern designs. Like it or not when it comes to your online presence, looks DO matter. Especially to women. Or so the studies tell us. Seamless shopping cart integration. So you can sell physical, digital or service based products. The ability to easily make changes and update your site on your own! Post blogs, with photos, right from your cell phone, to your website as easy as if you're posting Facebook! A site designed to capture leads. That means we'll integrate with your email marketing provider - Mailchimp, ActiveCampaign, ConvertKit, Aweber, LeadPages, etc. Mobile optimized. Because it's 2018 and Google wants you to. Easy to track metrics. How many people are coming to your site and where are they coming from? Gorgeous photos! Because a website is not a website without photos. Also, see #1 above. This package is for you if you are new in business and/or need to get your first site up and running in a short amount of time. Sites can be launched in as little as 2 weeks. Install FB Tracking Pixel & launch first retargeted Facebook Ad. 1/2 Day One-On-One session with Heidi to answer questions & lay out a starter marketing plan for your business. You've been in business for a bit longer and/or you are ready to go ALL IN and need more than just a basic setup. You'd also like help understanding exactly HOW to move forward and have a strategic plan of action laid out for you to help you grow. 1/2 Day One-On-One session with Heidi to lay out a marketing plan for your business moving forward. 60 Days of unlimited email/phone access to Heidi for coaching, business & marketing questions, etc.